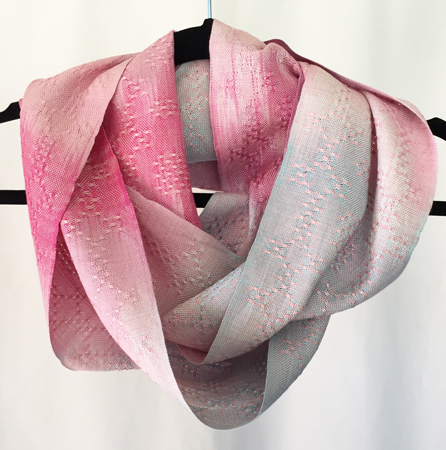 I’ve gotten six silk scarves woven and finished so far for June. I still intend to warp my loom with that lovely blue-green tencel I hand painted, and believe I can get it woven off pretty easily before the end of the month. 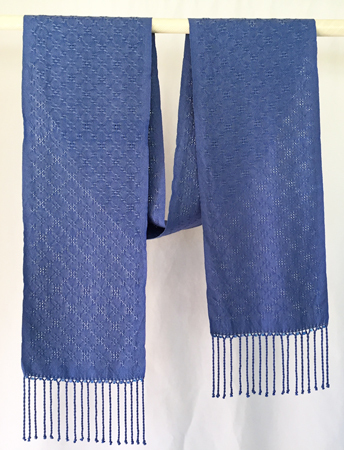 First I put on a warp of plain blue silk, threading the loom in a huck lace pattern I’ve used before. 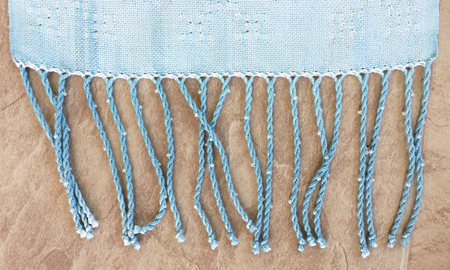 I used a slightly lighter shade of blue silk for the weft, and wove away. After it came off the loom I decided that this was the scarf to add beads to in the fringe, and luckily found some that were perfect for it in my stash. 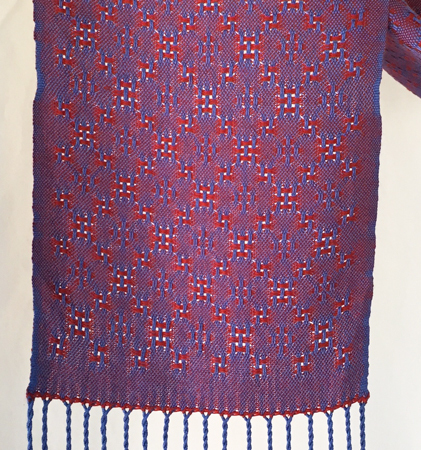 After this all blue scarf I decided to try and achieve some iridescence by using a red weft. I decided on a burgundy cashmere-silk blend, one that is so fine I had to use 2 strands together to approximately equal the weight of the 30/2 silk warp. It isn’t personally my favorite piece, but I hope it will call to someone else. 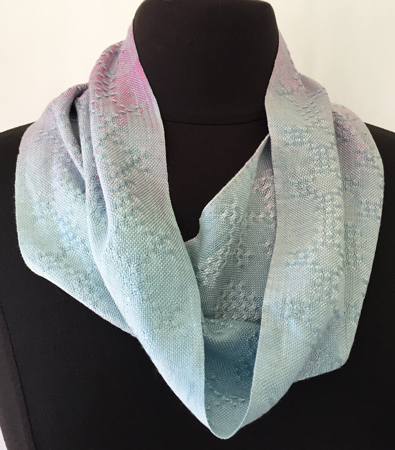 In this closeup you can see the lace design, and how light and airy it is, better than in the all-blue version. You can also see a bit of not-so-nice selvedge. I obviously did something wrong in my calculations, because I thought I could get a short cowl out of this warp, too, but nope. I was at the end. So be it. 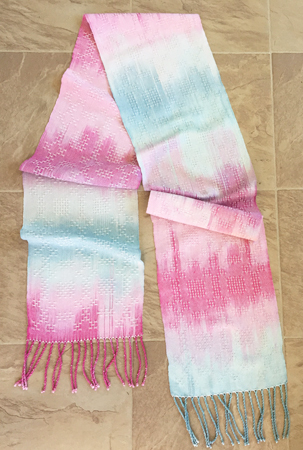 So then I put on that hand painted silk warp, the one that turned out very differently than expected. 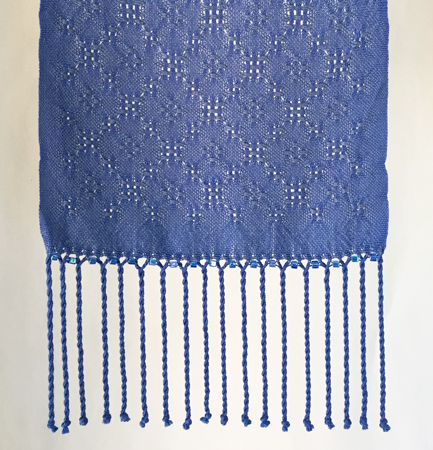 I decided to thread the loom with a huck lace draft that I spent HOURS working out a few months ago. I may have blogged about it; I can’t remember. Anyway, I had a few threading errors, which isn’t overly common for me, and had to tie some replacement heddles to fix them. I dislike tying those heddles and am far from quick at it, but it beats doing a ton of unthreading to correct errors in the middle of a piece, even when we’re only looking at about 240 threads. I tried a medium purple silk weft that I hoped would bring out the purples I’d intended when I dyed the yarn. I had to weave several inches and then walk away from the loom to be certain, but when I came back a few hours later – YUCK! I really hated it. It made what I thought were garish colors even more so, adding to the overall unpleasant look with the dark weft. Since the weft and warp were both silk, I didn’t want to waste either, so I unwove those several inches to start again. I went with the rule: black brightens other colors, gray muddies them, and white mutes them. Muting what what I wanted, so I picked a natural cashmere-silk weft, again doubled to approximate the 30/2 silk warp. I was very pleased with it as I was weaving, and with the final result. 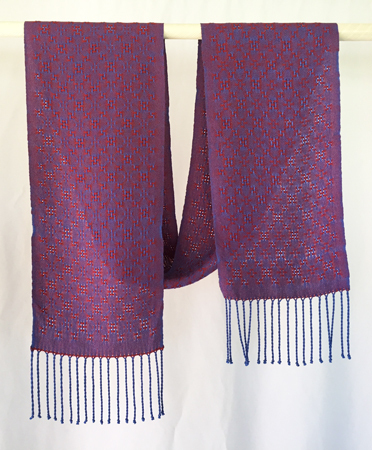 In fact, I like the scarf well enough that I decided to spend the extra time to add a bit of pizzaz to the fringe, this time twisting tiny pearlized seed beads into each bundle of fringe. I thought I’d planned enough warp length for one fringed scarf, one short cowl, and one long cowl. However after my experience with the blue warp (above), I figured I’d better approach the project a bit differently than usual. I wove the fringed scarf, then the short cowl so that the third piece would be as long as it could, whether that was a long or short cowl. In my continuing desire to use up my stash, I only had a small amount of lavender cashmere-silk so decided to use that for the short cowl. This isn’t a great photo, but I’m happy with the piece. Time for the long cowl. I decided to stick with pale wefts, and chose some 60/2 pink silk. I knew I’d need to use it doubled, and the 2 partial cones of pink I had were different shades, but I figured they’d work fine together, 1 of each. And they do. Surprisingly, I had enough warp left for another short cowl. This time I picked baby blue 60/2 silk. I only had one partial cone of it, so had to wind some onto a tube first so I could double it for weft. I really like this one, too, although again it’s not a great photo. I just realized that none of those photos shows off the huck trellis pattern I am proud of, so here it is. Need a wif? Let me know. So six down, three to go by the end of the month. I’ll be ahead of the game. Lovely, one and all Peg! Ahead of the game – – WOW!! Thanks, Judy & Alma. You’re always supportive. It’s a beautiful trellis pattern Peg. 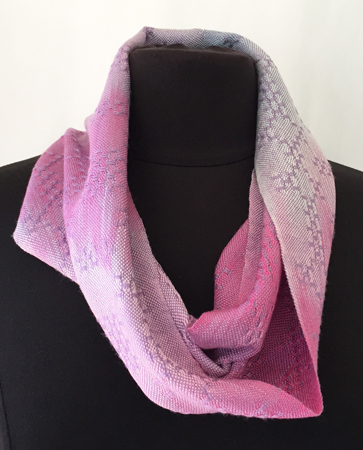 The makes are all lovely but surprising even me, I rather like the pink! I struggle with selvages at times too and not on the uber fine stuff you weave so beautifully either. Love your work! 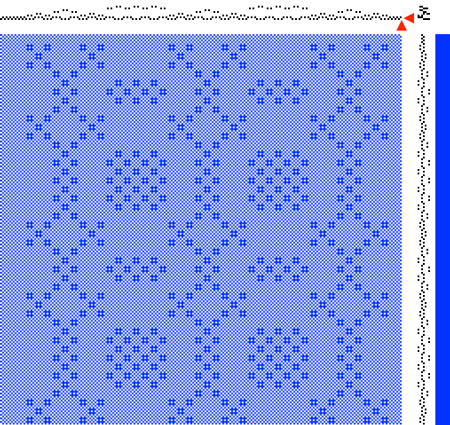 Can you send MW the WIFI for hutch trellis pattern? Will do, Leslie. Watch your email.